The Fannichs are a fantastic high-level ridge of 9 Munros located in the county of Wester Ross, Northwest Scotland. They are a varied group from rounded hills with grand corries, similar to the hills of the eastern Highlands, to shapely, pointed peaks more akin to the rest of the northwest . For the most part this is a grassy ridge with a few rocky outcrops and once you are up on the ridge, it gives a fine high-level promenade only once dropping below the 700m contour. The ridge includes Sgurr Mor & Sgurr nan Clach Geala, the highest peaks in the Northern Highlands and, being situated on one of the narrowest parts of the Scottish mainland, on a clear day the ridge offers views both east to the Moray & Cromarty Firths and west to Fisherfield, Assynt and the west coast. This trip aims to climb all the Munros summits on the ridge over the course of a 3-day long weekend. The proposed itinerary for the trip is outlined below with brief descriptions of each of the walks. Individual days can be joined for £60/person/day. A classic round of 4 Munros with a high level ridge walk over the highest peak in the Northern Highlands. Starting near Loch Glascarnoch, a long walk-in is rewarded with straightforward access to the high ground on An Coileachan, the most eastern summit in the range. From there it is an undulating walk westwards over the summit of Meall Gorm before a steep climb up the final cone of Sgurr Mor, the highest peak in the north. The descent takes a boulder-strewn ridge northwards to Beinn Liath Mhor Fannaich, the day’s last Munro, then an easy ridge leads down towards the car and the end of the day. Sgurr nan Clach Geala is the highlight of the whole Fannichs range and forms the central summit of the 3 Munros we will tackle on Day 2. The walk-in is short before a steep climb over grass and heather to the rounded dome of Meall a’ Chrasgiadh, a great viewpoint west along ‘the destitution road’ to An Teallach. After a quick descent the walk soon moves onto the spectacular Northeast Ridge of Sgurr nan Clach Geala with fine views over the mountain’s craggy eastern face. 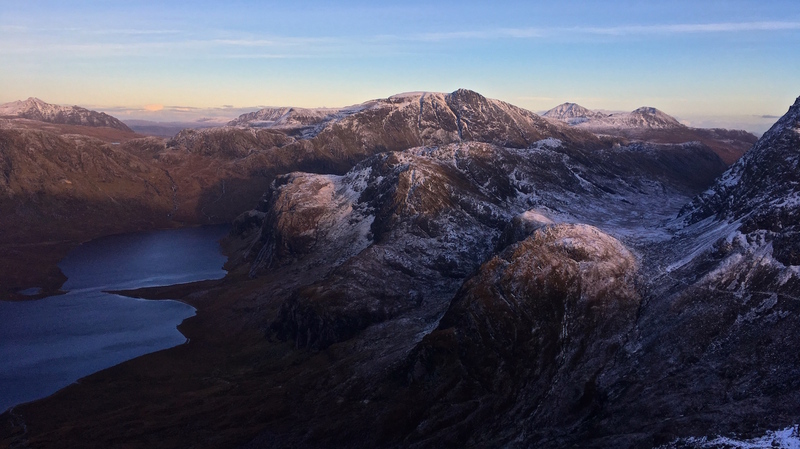 The ridgeline is followed all the way to Sgurr nan Each whose summit is perched above more dramatic cliffs, offering spacious views down into the glacial trough of Coire Mor. The descent from here leads to the lowest point on the main ridge at around 500m giving access to the glen of the Allt Breabaig, where a clear path leads gradually west to Loch a’ Bhraoin and the cars. The 2 Munros of the western Fannichs stand alone from the rest of the range, separated from the remainder of the ridge by a bealach at 500m, and provide a fine days hillwalk with good views to the nearby Fisherfield Munros. Starting from Loch a’ Bhroain once more, another short approach is followed by a steep pull to gain the ridge of Druim Reidh. Once on this ridge, the angle eases considerably and a gradual climb leads to the summit of Toman Coinnich, a Munro Top situated between the two main Munro summits. From here, pleasant ridge-walking gives easy access to the both these westernmost Munros in the range, firstly by a there-and-back to Sgurr Breac, then a short descent and climb to A’Chailleach. There are a few different options for the descent but all roads lead to the shores of Loch a’ Bhraoin from where a pleasant walk leads back to the road.